Top Withens01535 642329work Mountain or HillThe dramatic location of Haworth Moor is the perfect location for Top Withens. Top Withens is a ruined farmhouse near Haworth, West Yorkshire which is said to have been the inspiration for Wuthering Heights the novel by Emily Brontë. 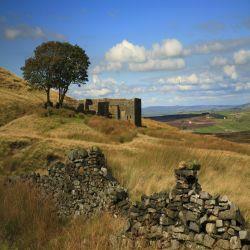 The ruin lies on the Pennine Way and is a popular walking destination from nearby Haworth and Stanbury. Such is the attraction to Japanese literary tourists that some footpath signs in the area include directions in Japanese. The dramatic location of Haworth Moor is the perfect location for Top Withens. Top Withens is a ruined farmhouse near Haworth, West Yorkshire which is said to have been the inspiration for Wuthering Heights the novel by Emily Brontë.